The drive from Dallas to Keene is bucolic in a quintessential Texas kind of way – scenery of grassy fields broken up by farmhouses. Keene is a small town, home to Southwestern Adventist University. The campus is still calm when I arrive, meandering my way to the building that’s brought me here – something that feels almost like a bit of a secret. It is only once I round the corner of the building that the hidden gem reveals itself, and I suddenly find myself peering over the edge of a railing, where, sitting in a sunken courtyard below me is a massive Tyrannosaurus Rex. This humble building is the SWAU Dinosaur Science Museum and Research Center, and it’s home to more than 20,000 dinosaur bones. It’s an impressive number when you consider the ratio of bones to students – roughly 25:1, with just under 800 undergraduates enrolled at the university. 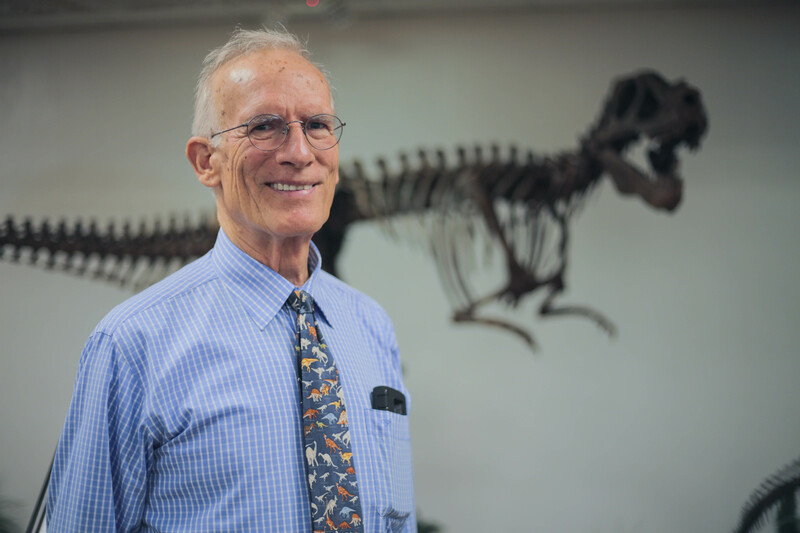 Art Chadwick is the director of the center and the driving force behind SWAU’s dinosaur research. He was the head of the university’s Biology department for a number years, and also taught courses in Geology and Paleontology. Shockingly enough, he wasn’t always so keen on the research of the prehistoric beasts. “Well, I really wasn’t interested in dinosaurs at all,” he admits. “I was working on the taphonomy of fossil whales down in Peru.” A taphonomist, he explains, is someone who studies everything that happens to a fossil from the time it’s alive until it’s excavated from the ground. It covers behavior, what the creature was doing when it died, cause of death, and the subsequent fossilization process. All skills that, fortuitously enough, are easily transferrable from whales to the dinosaur realm. Art had been working in South America on the whales for several years when he got a call from a friend asking if he’d be interested in checking out some dinosaur bones. A call that, no doubt, most of us would drop everything to answer. But Art wasn’t so easily convinced. “I really wasn’t very interested at first,” he recalls, “because I had plenty to do, and dinosaurs had no particular attraction to me.” Nonetheless, his friend persuaded him to come check out the site, a ranch in Wyoming. 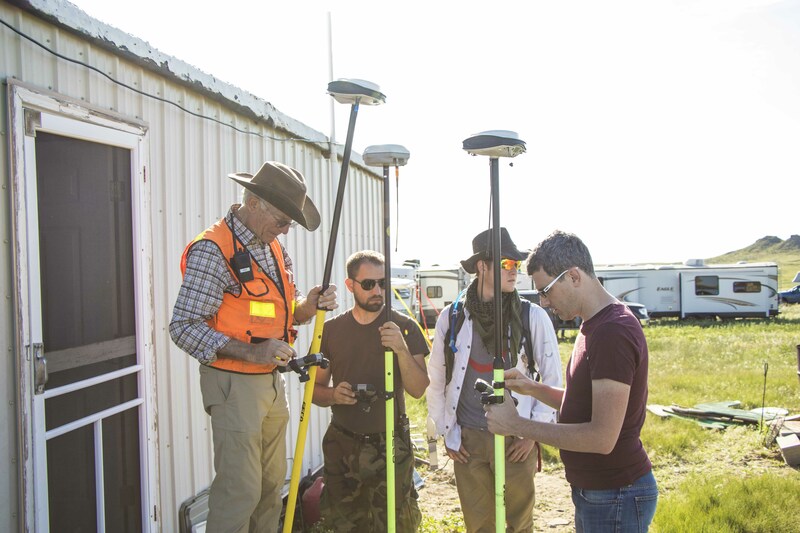 Art brought on equipment that’s normally used in surveying: “High resolution GPS, RTK. And we started mapping our bones with that in the year 2000.” They have high-resolution GPS data for every bone that they take out of the ground. 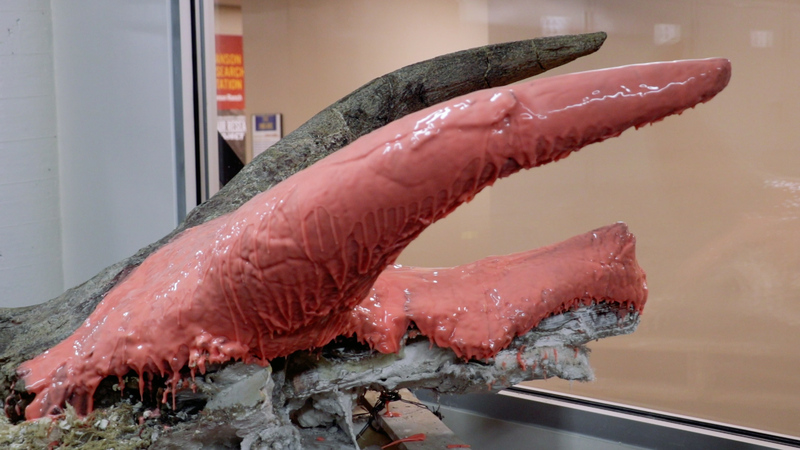 And therein lies one of the most impressive parts of the SWAU Dinosaur Research Lab. To the layperson – me, for example – the impressive part is being surrounded by thousands upon thousands of prehistoric items that used to be inside dinosaurs. But to a scientist, SWAU’s real gem are their data. 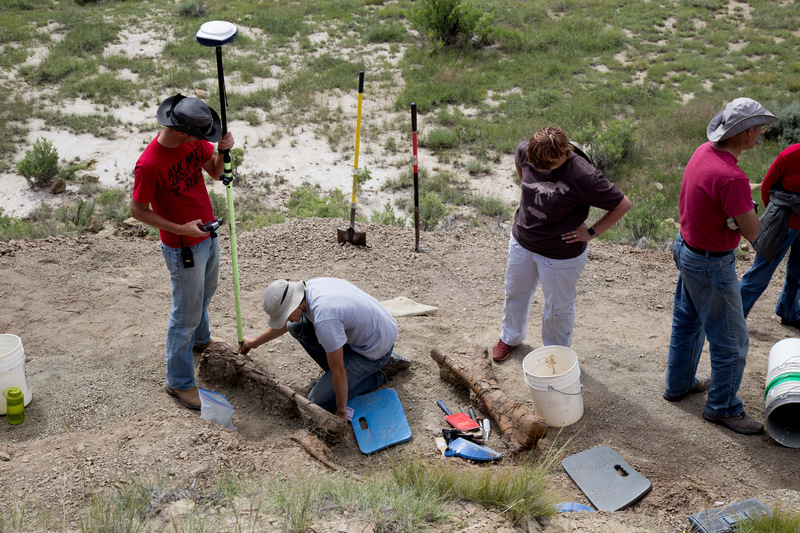 Once someone in one of the Wyoming dig sites – called quarries – hits a bone, the team works to excavate the specimen as carefully as possible. Once it’s exposed enough to where the dimensions are visible, they bring in the GPS to take measurements and photographs. The bones are then shipped back to Keene where they’re cleaned – I watched a girl use what looked like a dental drill to carefully remove dirt – and then photographed. In one corner of their photo lab is a circular table upon which the specimens are placed. The table rotates 360 degrees, during which time 32 photographs are automatically taken. They turn these images into virtual 3D images as well as 3D models and STL files. All of this information – the bone catalogues, the maps and GPS data of the bones in the ground, photos, 3D images, and STL files – is all available on the Dinosaur Museum’s website. Simply enter a keyword – Triceratops, for example – and you’ll be treated to dozens of listings of bones and teeth with corresponding data for each specimen. 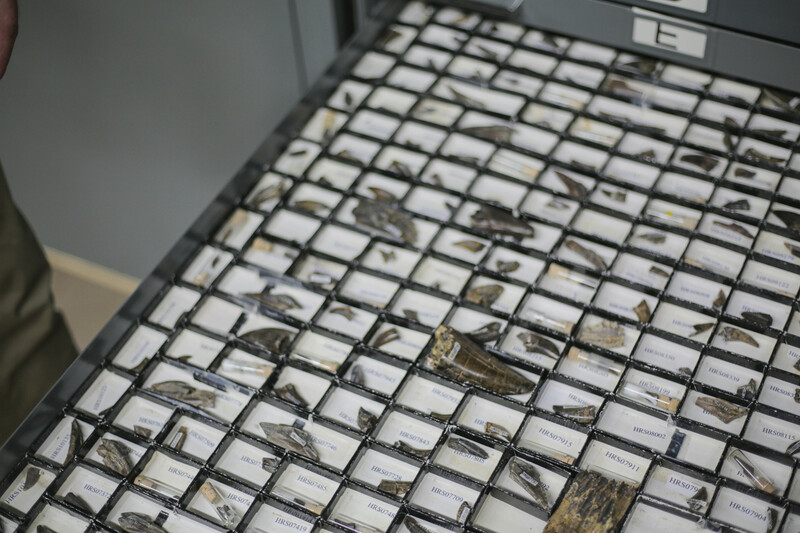 “There’s a lot of information available to anyone that wants to do research on these bones,” Art says. I say that’s an understatement. This is an almost indescribable treasure trove of scientific data, collected and amassed by an unassuming university off the beaten path in Texas. One dinosaur discovery in particular finally pushed the museum over the edge. “Two years ago, we found a more or less intact Thescelosaurus.” A Thescelosaurus is a plant-eating, slightly-larger-than-human-sized dinosaur. “That was a big breakthrough for us,” Art recounts. 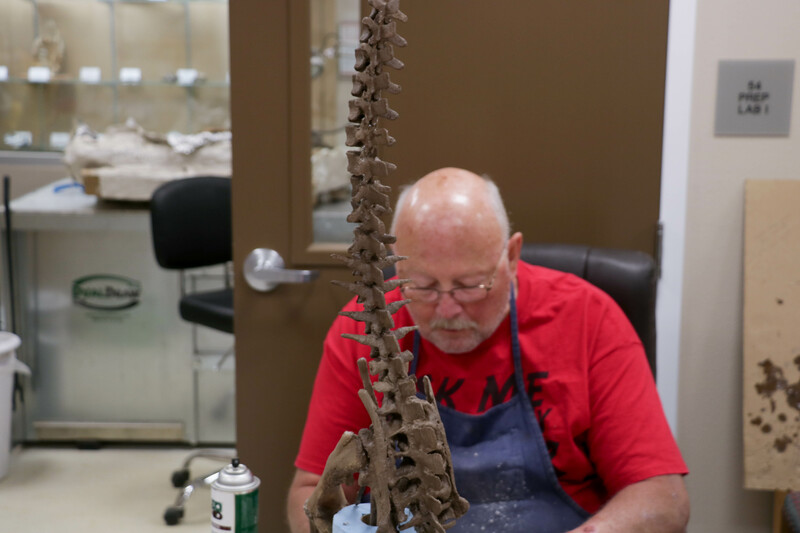 But when it came to displaying the skeleton in the museum, they quickly found that assembling the whole thing would have been destructive – they would have lost bone in order to make the armature to hold the specimen. Art found his way to Gigabot because, as he explained, “That’s the biggest printer that we could get.” They wanted the ability to print larger bones without having to break them into many smaller pieces, as they would be forced to do for larger specimens on a machine with a smaller build volume. The university brought their Gigabot home (Art came to our Houston factory to pick up the machine himself, which was a treat for both parties. “The fact that they’re all real human beings, they’re interesting and it was just delightful to me,” he added.) and promptly kicked off a massive print. And of course, there was the original impetus for the Gigabot purchase: the Thescelosaurus. 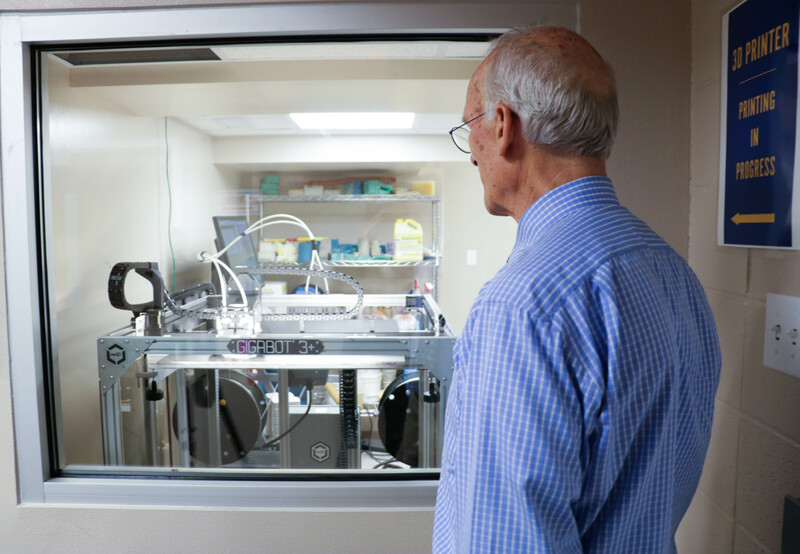 “We kept it busy, day and night, for a long time, printing out all those bones,” Art says, of Gigabot. “Several hundred hours for the whole print,” he estimates. 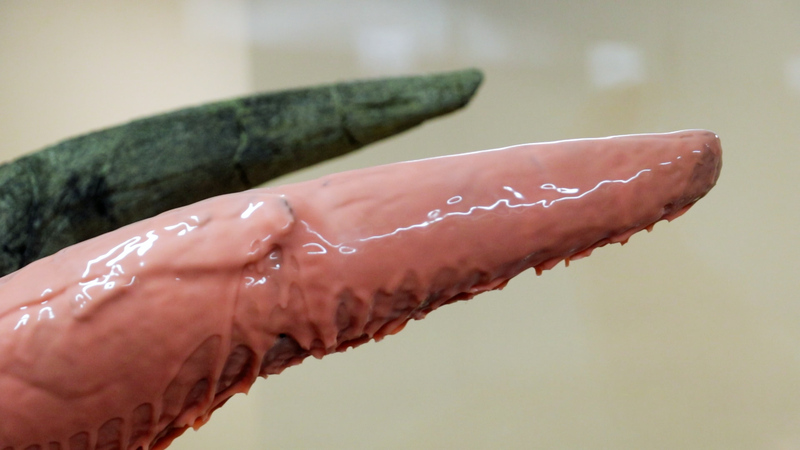 The full, 3D printed specimen stands on display in their museum. Traditionally, museums accomplish the replication of specimens like dinosaur bones with casting. And although tried and true, this technique has its faults. To name a few, it’s expensive, time-intensive, messy, and potentially damaging to very fragile specimens. It also falls short when there’s a missing bone. 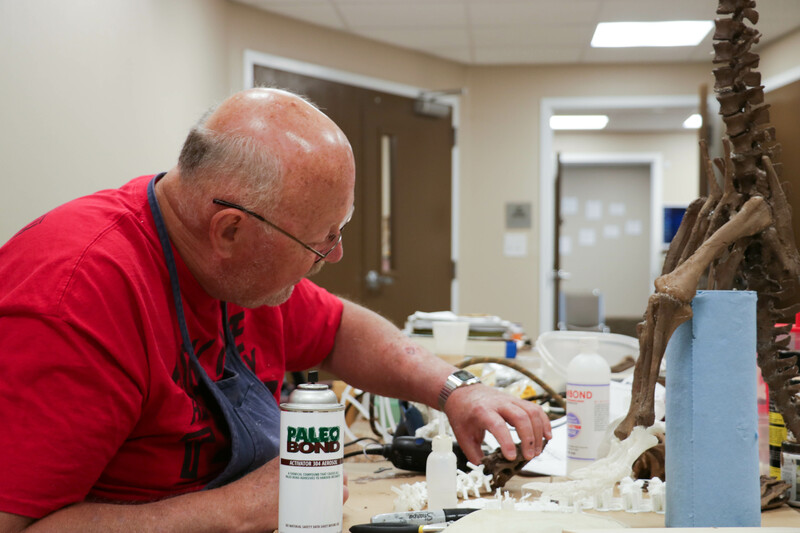 And while casting will get you a really good replication of a bone, Art finds that he actually prefers the 3D prints to conventional casting. “I have found that I prefer the not-perfect-printing to having a perfect replication anyway,” he says. “If I made every vertebra the same using a casting technique, it would be very obvious on the specimen. But with 3D printing, there’s enough variation in the surface so that we can get every bone looking different.” As they would be on a real animal. His team shares what they’ve discovered – the GPS data, the maps, the images, the STL files – in the hopes of helping someone else with their research or encouraging someone who’s interested in dinosaurs. The proliferation of the technology aids their mission with the general public as well. 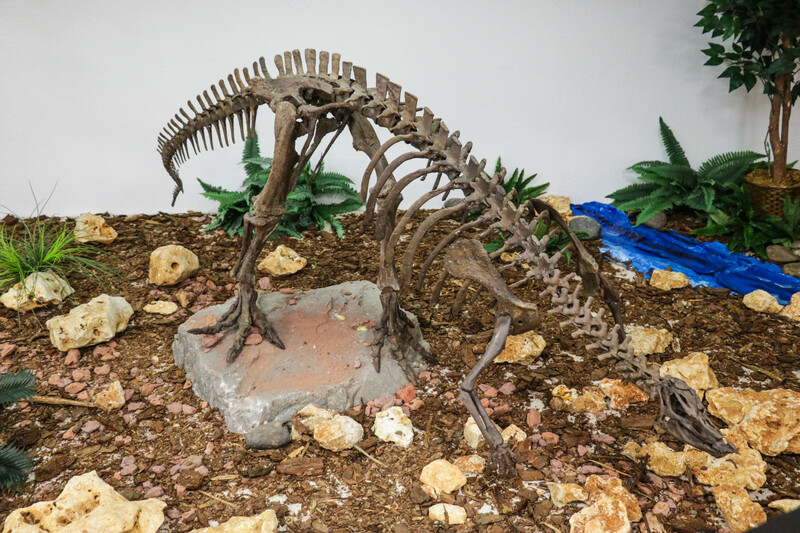 Southwestern Adventist’s dinosaur digs and research are ongoing, and there’s still plenty of work to do. They’ve accumulated their 20,000+ bones over the last 20+ years working in Wyoming, and each year they return and bring back another 1,000 or so bones. They’re coming back with Edmontosaurus – duck­billed dinosaurs that are 30 to 40 foot long (“A giant of an animal.”), Oviraptor bones, massive Triceratops skulls (just its head is seven feet long and weighs about 500 pounds), Nanotyrannus (they dug up the second specimen ever found), and Tyrannosaurus Rex (“Of course everybody’s favorites are T­-Rex teeth. 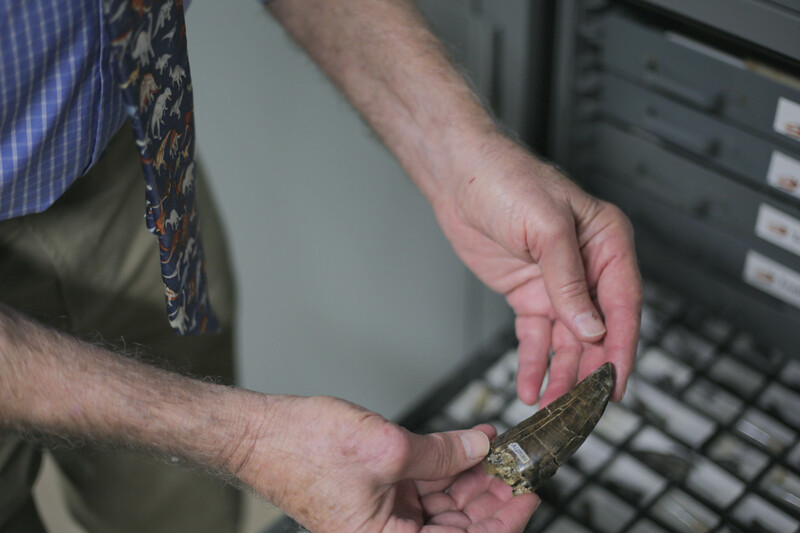 If you find a T-­Rex tooth, you found something really big.”). The bones that once littered the ground when Art first visited the ranch are being preserved, catalogued, and studied in the name of science. One of the questions they’re trying to answer is, with a bone bed spread over 50 acres, made up of scattered bones of dinosaurs, how do you get all these bones separated from one another and then deposited in a single layer? And why are they finding a lot of whole animals in one site, but only disarticulated remains in another site? Piecing together the story of what they see in the field is the name of the game.